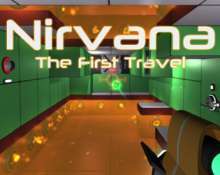 Nirvana was a company specialized in gravity research. At first, all they had was a spinning room, and the desire to, one day, be able to manipulate space-time, and therefore, gravity itself. Then came the day: they finally made it. All the equations were right, and that led the Nirvana Facility to prosperous times... for around two hours. Gravity could do so much more than deform space time, so much more... and they found it in a "not so good" way. They ended up colliding their dimension with someone else's, opening a very unexpected gateway. What, or who, did they find in the other side? The puzzles on this game usually present you with a situation, with no obvious way out. You must use all the resources at you disposal to proceed, and keep moving foward. You play as Tom Walker, a security guard that wakes up in an empty room inside the Nirvana Facility soon after an emergency evacuation. Right at the beginning, you meet the familiar voice of Doctor Lestrade, the man to instruct you through the various puzzles the facility presents. The puzzles involve interesting gravity shifts, and a gun that can move heavy objects, create anti-gravitational spheres and teleport Walker around.